Though Spa treatments have been finding favor with the stressed out only lately, there is an ancient therapy which was developed by vaidyas, the practitioners of Ayurveda in Kerala, India, as a restorative therapy to treat a variety of conditions including eye diseases, sinusitis, allergic rhinitis, neurological disorders, insomnia and certain skin diseases among others. In the ayurvedic spa scene, Shirodhara & Champisagge are well known for its relaxing effects. 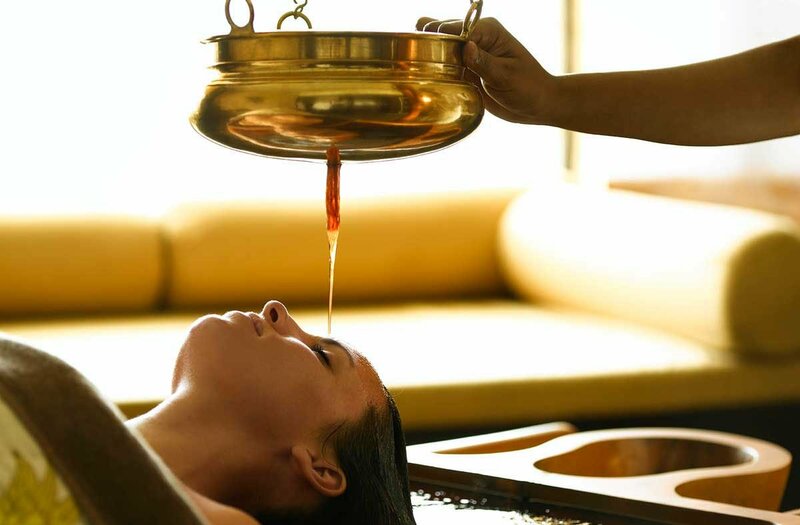 Shirodhara, the heavenly head massage involves continuous pouring of warm herbal oil over the forehead, which is then massaged into the scalp and head. This brings a state of deep relaxation peace, which is ideal for the stressed-out. The goal of Shirodhara treatment is to stimulate circulation and rid the body of impurities. It also improves the functions of the five senses and helps address anxiety and depression. Rejuvenation is the primary goal, and hence is known world over as the ultimate mental and emotional relaxation therapy. Another traditional Ayurvedic treatment is the Champisagge head massage. It was originally developed as a system of grooming, where mothers would massage their daughter’s scalps with oil to encourage the growth of long, lustrous hair. But, over the years, it has evolved to include massaging of the head, neck and face with different pressure to clear energy channels. These energy channels are often blocked, causing a build-up of negative energy that is believed to be the root of various ailments. Stress typically accumulates in the head, neck and shoulder regions. Using this technique, these areas are gently, firmly and rhythmically massaged until the tension melts away. No oils are used, and it is done while one is seated on a comfortable chair. This massage provides relief from eyestrain, aches in the neck and shoulder areas, and other stress and work-related symptoms. Other benefits include healthy hair growth, energy flow balance, and achieving a deep sense of inner peace. As in all ayurvedic treatments, there are no known harmful side effects for both Shirodhara and Champisagge. Only thing to be ensured is that these treatments are taken from well known leading Ayurvedic hospitals for supreme effect.